Standing Waffle Cone Multi Scoop... / p.o.s. This free-standing 4ft Waffle Cone Ice Cream, with 3 coloured Scoops (brown, green & pink) & whipped cream, on a square metal frame base, is an excellent way to advertise that you serve Ice creams. 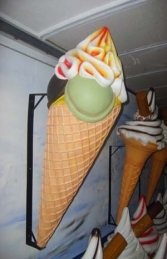 Multi-Scoop 4ft Free-standing Waffle Cone Ice-Cream point-of-sale pavement display model, with 3 coloured Scoops (brown, green & pink) & whipped cream, standing on a square metal frame base. This 4ft high 3d Ice-cream display model on a square metal frame base is also available in a wall mounted hanging version (JR HWC4-MC) & a flush to the wall halved version (JR WRWC4-MC).